On Monday, March 24th, a large WSIC audience participated in an unconventional discussion on the pros and cons of expanding the Toronto Island airport. The event was unusual because only one guest speaker presented the topic, instead of our customary two or three hosts. As a testament to the sensitivity of our topic, only one qualified expert was willing to field questions before a large gathering of concerned citizens on a subject so personal to so many people. Thankfully, our guest speaker did not disappoint. Paul Bedford, former Chief Planner of Toronto, did a formidable job outlining the nature of the proposal for the Toronto Island airport expansion, as well as the benefits and risks of pursuing the development. Paul acknowledged that a big attraction of the Toronto Island airport stems from its central location, and therefore convenience and accessibility. As a testament to to its success in addressing the need for business customers, the airport usage has grown from around twenty six thousand passengers to over two million annually over the past decade. Whether or not jets are allowed, the airport is set to handle even more passengers in the near future. However, to fulfil these objectives, amendments need to be made to existing agreements prohibiting or restricting the types of aircrafts that can take off and land. Additionally, infrastructure issues (such as congestion) and safety measures need to be addressed. The process leading to expansion, if it were to take place, would be complex with many logistical obstacles to overcome. It isn’t merely an issue of jets or no jets. Logistics aside, the real core issue for debate is that of scale, balance, and impact on the Toronto waterfront area. Can we maintain a fair balance of these objectives? The land mass where the airport is located will not get bigger, so other adjustments will have to be made to accommodate higher passenger volume with existing limits. If airport operations are already congested, we need to ensure congestion will not get worse as a result of expansion. We need to preserve a good mixture of recreational, cultural, and commercial land uses – such that land is not dominated by any one use over the other. The impact on local neighbourhoods should also be considered: will citizens be disrupted by aircrafts taking off and landing every three minutes? How will a decision to expand the airport affect future development plans for the Toronto waterfront area? Is it fair to ask a school to relocate in order to expand an airport? Paul asked audience members to consider a number of questions – including whether a decision to allow jets at the Toronto Island airport is irreversible once made; whether allowing new airline carriers such as Air Canada, West Jet and United Airlines starts a slippery slope towards even bigger airline concessions in years to come; and whether the soon-to-be-operational Union Pearson rail link could help improve Torontonians’ view of Pearson as an attractive and accessible alternative airport. 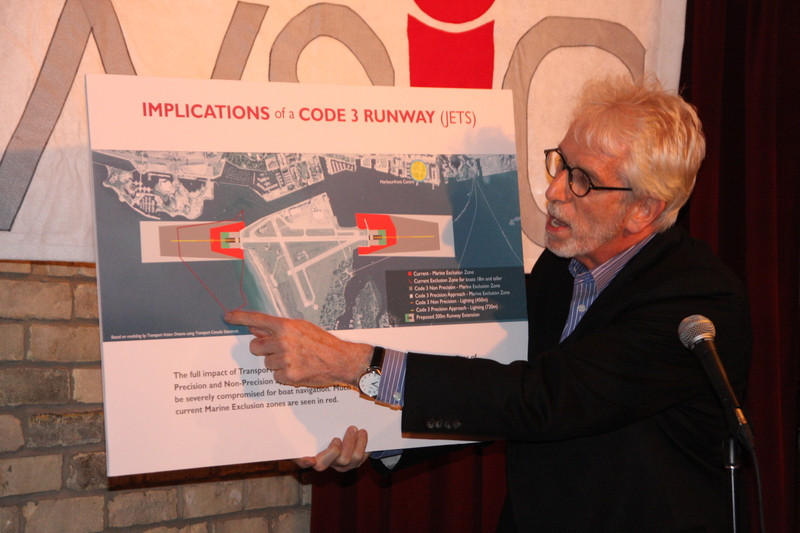 Paul was candid with audience members that his current preference is to prohibit the allowance of jets at Toronto Island airport, but he acknowledges that arguments can be made in favour as well. Paul’s most pointed argument of the evening was highlighting the exclusion zone for an extended runway. Should Instrument Landing Systems (ILS) be requested for the jets, the exclusion zone effectively prohibits watercraft from the harbour. However, Porter has not requested an ILS and there is no indication one will necessarily be installed in the future. WSIC audience members asked a range of questions which clearly demonstrated their knowledge and interest in the subject matter. The mixed views of our participants properly reflected the spectrum of opinions on how this contentious question should be answered. Are we better off converting the waterfront into a national park? Would we benefit from Porter airlines marketing their flight services to leisure passengers in addition to business passengers as part of their expansion campaign? It was pointed out that by having a city centre airport capable of servicing larger distances, Toronto could potentially be a more attractive hub for corporate offices. Is the city willing to turn its back on the potential economic benefits of connectivity? We may now be one step closer to finding out the answer. On March 26th, Toronto’s executive committee approved the proposal to allow negotiations on an expansion of the airport to take place. Whether you support or disapprove of the expansion plans, it is important to let your city councillor know how you feel it will impact you and the city you want to build. 1 Comment on "The complexities of expanding Toronto’s Island Airport"
So glad you discussed this locally huge issue. And thanks for all your efforts engaging and motivating youth and lesser adults with hope into super daily-choice living and influential action! About the airport, please don’t be misdirected by details of how and to what degree we should, for the sake of convenience and some money-making for some businesses (many of whose end products, anyway, are as much waste and exploitation as anything else) poisoning our children’s air (many Toronto and Ont kids sent to hospital, and even die directly from smog according to Public Health authorities), the source of our drinking water, not to mention the home of many fish, the birds, Global Warming, tar sands, and on and on! Let’s make world-class choices for our great Toronto!